can the CW not spoil next week’s Arrow before they show me this week’s? So today I’m watching the Flash on the CW website, specifically the episode from Tuesday October the 27th because I only caught the last half from when it originally aired; I cannot recall which of my many projects I was working on in its stead, but looking back I deduce it was this blog. That’s meta. As I missed the episode of Arrow for Wednesday October the 28th, due to my work as DJ Trivia host at the Stagecoach Inn in Marshall this was before I can watch Wednesday’s episode. So to set the stage for you, I had not seen the episodes of The Flash for October 27 nor Arrow for October 28. 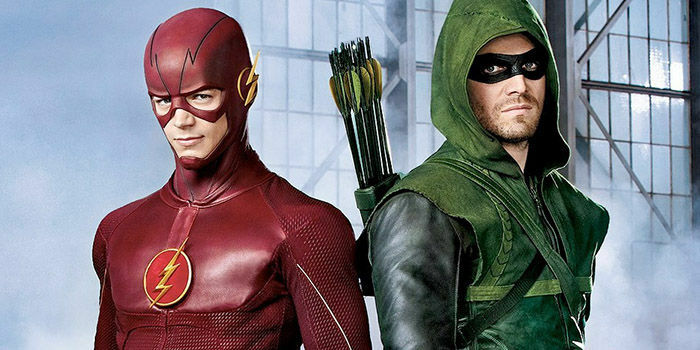 I still have not seen the Arrow episode, and logically I would not have seen the Arrow episode at the time I watched the Flash episode. These were new episodes of this past week. Naturally television shows streamed through the CW website have some amount of commercials and aside from my attempts not to get any spoilers for the upcoming 007 film, Spectre, I don’t resent any of these advertisements as I expect these fine capitalists to attempt to create revenue as they entertain me. I think the house ads for the Flash, essentially an extended trailer for the first few episodes, are incredibly awkward considering I am watching the show they attempting to compel me to watch and I saw all the bits from the trailer already play out within the series proper. These people are thoughtless assholes. Likely it’s just a small number of employees that are assholes. See in one of the house advertisements they promoted an episode of the Arrow. During a catch-up watch for an October 27 episode of The Flash they were not attempting to convince me to watch the October 28 episode of Arrow; instead they spoiled parts of the October 28 episode of Arrow by showing me a trailer for the November 4 episode of Arrow. It’s a minor thing but they were illogical to assume I was caught up enough to want stuff from so far ahead, and those house advertisements don’t do anything to increase my enjoyment of what I am already watching. All rebuttals and defenses of the faceless soulless corporation simply assume that I was all caught up on one before I watched the other instead of watching these things in order. If I am watching off the website then no I am not caught up. This is why people pirate television episodes; I do not endorse nor encourage violating intellectual copyright laws.